The Chinese coins are made of metal, thin but sturdy, lightweight and easy to carry; Embossed design: clear lettering, Chinese characters are clearly visible. 5 style reflect 5 different Chinese dynasties with 5 names of Chinese ancient emperors, include Shunzhi, Kangxi, Qianlong, Yongzheng and Jiaqing, each style comes to you in random quantity. Each coin has a square hole inside the circle, in Chinese culture, the circle represents the world and the square means the land, dynasty characters symbolize human, with these 3 respects together, so people believe they can attract wealthy chi and bring protection. 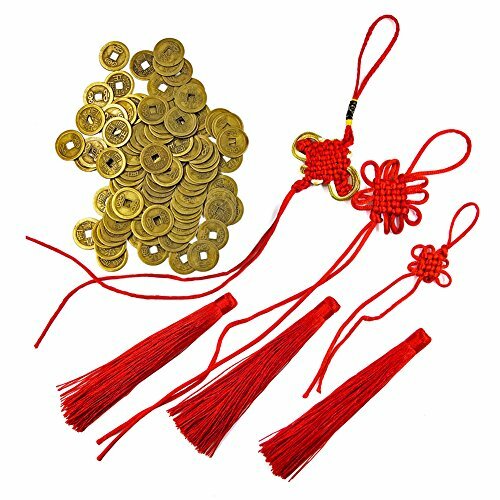 The coins can work as party favors for New Year, also can put them in purse, wallet and handbag, fit for wearing them as bracelet, necklace and more, which mean to bring you luck, health and wealth in Chinese culture. You can also DIY or as a gift for others . Small and inedible coins, please keep away from kids under 3 years old. Do not put them in the mouth or swallow them. Feature: each coin has a square hole inside the circle, in Chinese culture, the circle represents the world and the square means the land, the dynasty characters symbolize human, so people believe they can attract wealthy chi and bring protection. If you have any questions about this product by DMIDEA, contact us by completing and submitting the form below. If you are looking for a specif part number, please include it with your message.